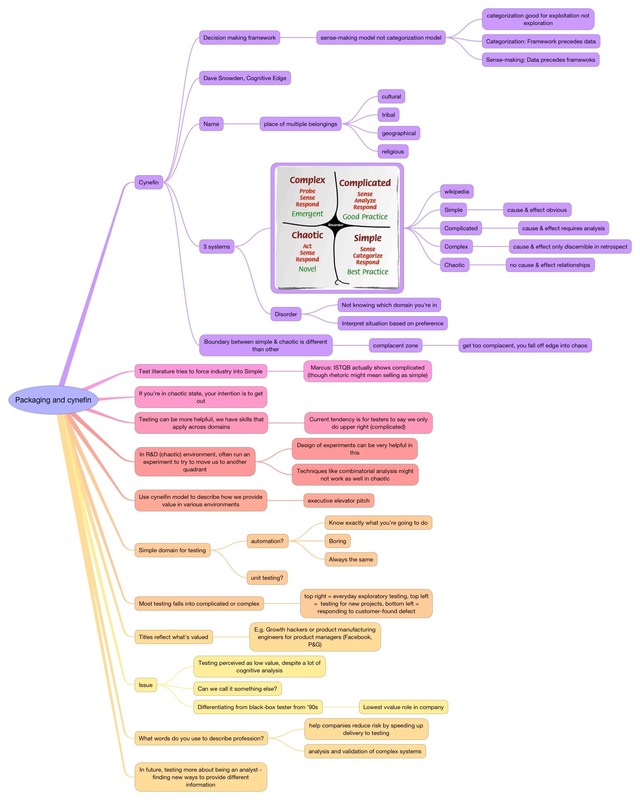 The last 3 sessions I was in resulted in smaller mindmaps. I was mentally processing more information and thus didn’t capture everything. I’m going to combine all three mindmaps into a single post. First up was a discussion that Matt Heusser facilitated around the Cynefin sense-making framework. Matt sees value here for testers and was hoping to gather others who knew about the framework to refine some ideas. Most of us hadn’t heard about it before, so we spent some time discussing the framework. You can see more about it at Wikipedia. I was one of the group who was brand new to the framework. I think there may be something here as well, though as I was talking to Heather about it, she was less sure about splitting apart the simple and complicated order. Chaos theory was her area of interest when she was working towards her PhD., so I’m going to defer to her to post more thoughts there. The next session was the tail end of Ale Moreira’s session on motivating testers. 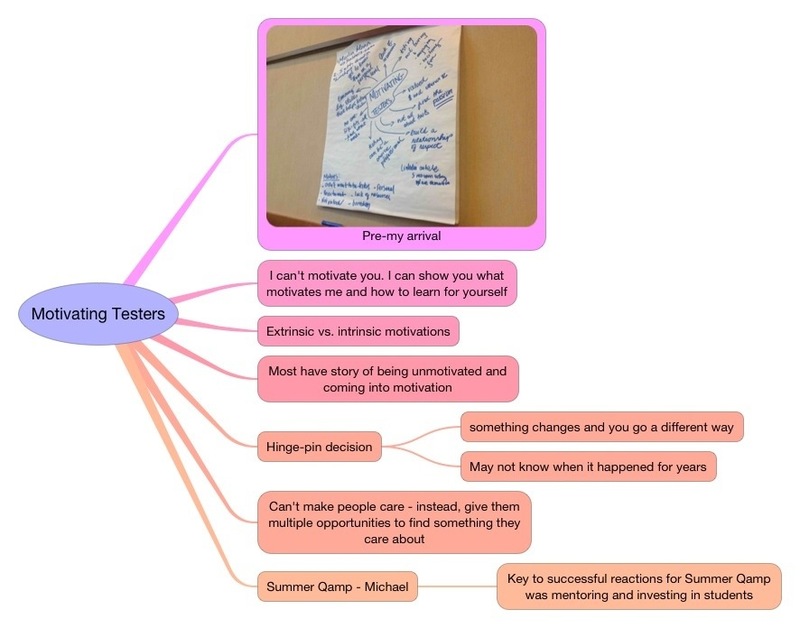 I missed the first piece, so my mindmap includes a photo of the easel pad that was already on the wall. While I was in there, we ended up going around the table and talking about the point where each of us became motivated testers. Michael Larsen recorded these stories, and has the audio up on his blog. It’s a ways down the page but there’s a text link to the audio file. Overall, I had a great time at TestRetreat, and I’m glad that Heather and I both made it. We waffled a little as we’ve got a lot of travel going on this time of year, but it was definitely worth attending. (This is a common occurrence – I need to go to more of these so I remember how much I like them).